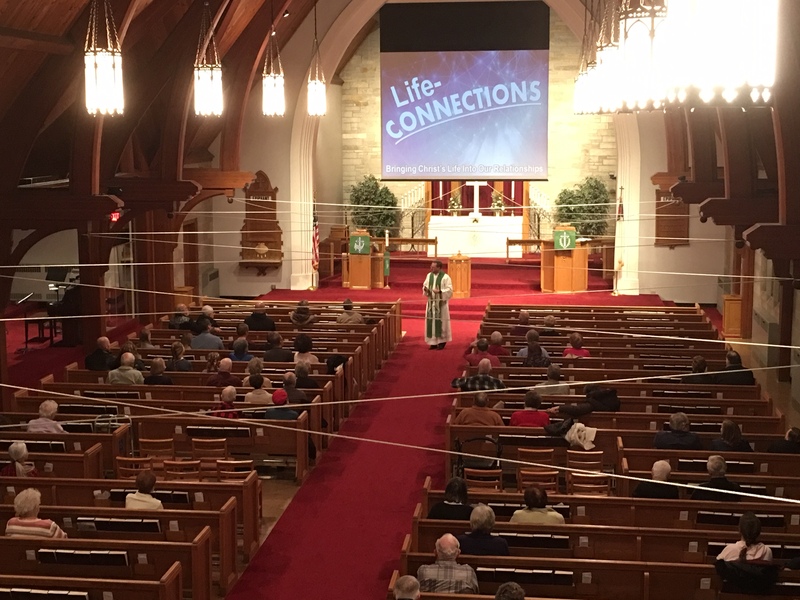 St Johns West Bend – Live Connections – What is that Rope For? Live Connections – What is that Rope For? If you were in worship at St. John’s this weekend, you couldn’t have missed it. The ropes? . . . Actually, “Life Connections.” Certainly, you noticed the 450 feet of white rope extending from the arms of the white altar cross, crisscrossing from beam to beam, 12 feet over the heads of the congregation, and ending with an arrow-like point over the door frame of the sanctuary. This visual creates a contemplative object lesson for the current “Life Connections” series. Our altar and cross boldly reflect the forgiveness and life we bear as those who’s scarlet sin has been turned white as snow. (I know we’ve had a lot of that lately and you may be sick of dealing with it, but don’t lose perspective). The white ropes extend from the cross as Christ’s resurrected life extends to us in baptism. It’s Christ’s life that connects us in relationship, like the intersecting ropes moving throughout the sanctuary. Yet, even in this wonderful work, Christ’s life does not end when we, as Christians, leave the church building. It must be shared, it must go with us as Christ Stations into the world. This is why the ropes form an arrow point, steering us out after worship to a world that needs the same message of Christ’s life that has nourished our faith in His Divine Service. Bringing Christ’s life into our relationships is work, but it’s work rooted in God’s unending and abundant grace and forgiveness. It’s work that celebrates being in Life Groups together and celebrates our unearned and unshakable connection to our almighty and everlasting God. These Life Connections meet the brokenness we share and encourages lives of prayer and sharing our stories of discipleship. So, for the sake of your Life Connections, when you come into worship, look up and don’t miss it; God is preparing you to bring Christ’s life into your relationships and into the world.